Hey, hey, hey today is Career Fair Day!!! As everyone anxiously prepares for the big day, here are a few last-minute tips to help you have a successful experience! Don’t stress! 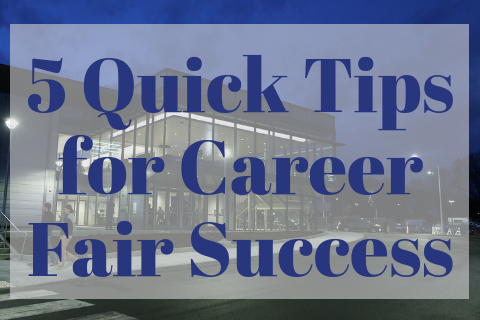 While the Career Fair is an important event, it is not the be-all-end-all of Career Events. It is certainly a great way to get your foot in the door with your desired company(s) and expand your network, it is not something you should completely stress out over. A bit of nerves is completely understandable, but it shouldn’t be something that keeps you from sleeping tonight! As long as you have everything you need ready to go, you will be fine! Also, while the Career Fair is from 1 to 4, you should not feel obligated to be there that entire day! Even just 20-30 minutes can be sufficient time to get the experience you need and chat with any desired companies. Don’ forget your name tag and lanyard (Fast Pass) if you already have it so you don’t have to wait in line! If you didn’t have a chance to get your fast pass, don’t fret! Make sure to bring your student ID and leave a little extra room in your schedule to get registered. For the second time ever, the Career Fair is in the Bentley Arena! While this is very exciting, it does make access a bit interesting. Like always, there will be shuttles on a continuous loop through campus that will stop at the normal Bentley Shuttle stops in order to take students to and from the Career Fair. If you’re coming from off campus, be sure to park on lower in the Orchard Deck, otherwise you will need to park on upper or mid-campus and take the shuttle down. If you decide to opt for walking to and from the Career Fair, please be cautious and aware of your surroundings! Make sure you have your important materials ready to go and that you have completed your research using this tool. This means your: resume, elevator pitch, Pad-folio, business professional outfit, and your handshake (basically everything on our checklist)! Have questions about any of these? Stop by one of our info table in the arena and we will do our best to get your questions answered. Side note: your resume does not need to be on special paper, plain white paper is perfect! Practice that elevator pitch, take a deep breath and BE YOURSELF! We will see you TODAY between 1 and 4 pm… Happy Networking!